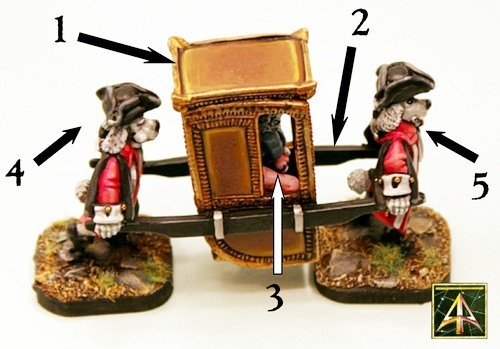 Alternative Armies: 28mm Sedan Chair released! Who says Alternative Armies is not the inventive alternative? Not many and not now! We are delighted to present to you a fantastic 28mm scale white metal and resin kit for use in any Historical or Flintloque and Slaughterloo setting. An 18th Century Sedan Chair kit. You can get it on its own or with a set of two Dogmen bearers and a Dogman passenger. Go HERE or read on for more including many images and a free download article with rules for Flintloque and Slaughterloo. Our big release for Valon this month. "A full two minutes passed before, at a full run, two Dogmen tongues lolling and steaming in the cool air came to the Baron. Between them they carried a Sedan Chair. The Baron’s own chair a family heirloom. They placed it down and then bowed before one of them opened the door of the Sedan Chair and stepped back. Abelard Von Canin entered the small vehicle and sat down. The door was swung shut and he was lifted before setting off at a fast pace out of the town. The jarring of the cobbles of the street was lessened by the velvet seat and the arms of his bearers. As the houses slipped by and they left Whinesbark the Baron made one more check upon his uniform and then lifted his pistol from its holder." Based on a real 18th century mode of transport for the wealthy Alternative Armies is delighted to present the Sedan Chair in 28mm scale. This is a 28mm scale white metal and resin set. You are supplied with the following which require assembly of a basic nature. 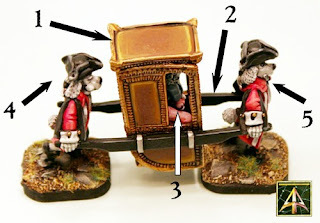 In resin the back piece, the front piece, two sides, seat and roof of the vehicle (1) and in white metal the two bearers poles (2) as well as two different Dogmen Bearers (3,4) and a Dogman passenger with double pistol (5). Once assembled with bearers measures 75mm long, 25mm wide and 30mm tall. Sculpted by our lead designer Sam Croes. Refer to the numbered image. Suitable for use in any 28mm Historical system or in Flintloque and Slaughterloo. 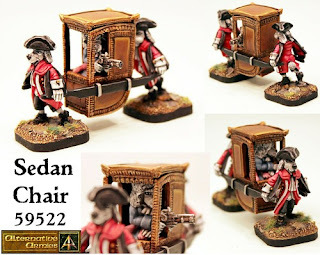 Note you can purchase the Chair kit on its own too using the drop down menu Note other miniatures shown are for scale and setting only and are not supplied. You can also purchase pro-painted and based ready for play. Go HERE. 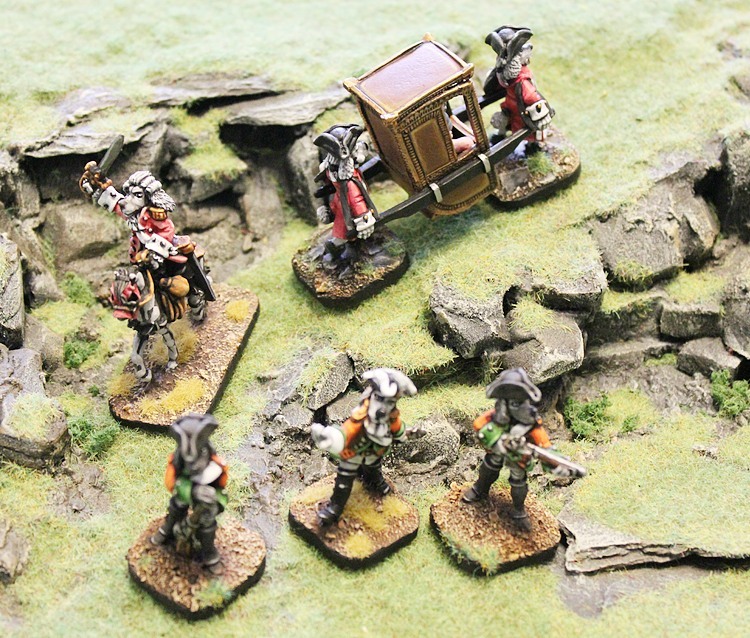 Players of Flintloque and Slaughterloo are most welcome to make use of our free Article with rules for this vehicle HERE from our Dropbox. Enjoy! We have many different Dogmen with which this pack can be used and of course it can be used with allied races such as Dwarves and Elves. We plan on making more bearers and passengers too over time. 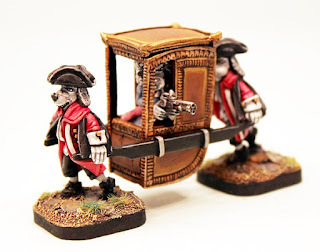 If you are interested in getting into the Army of Ostaria or the Army of Pudigrochumsberg just click on the links to see them all. Playing the games will need either 5028 Beir and Bones for Flintloque or 5030 Slaughterloo 2nd Edition. You can get either of these in print or as instant paid downloads too. Will you be adding alternate handlers and passengers for the carriage? Fantastic minis! Thanks for sharing! Great looking model and I can see it being used with many different races - just swap the heads! Thanks Tony. I had hoped you would like it. Yes, that is totally possible.